Compare home warranty policies from the top ten home warranty service providers in tallahassee. To further assist you in selecting your policy, we have created a graph with a bell curve that showcases the average price of premium and average deductible of the various home warranty policies that are purchased throughout the state of florida. View more... The X-axis indicates the price of the premium while the Y-axis indicates the number of homeowners. The start of the curve indicates the number of homeowners who purchase policies that have low premiums. The curve then rises to indicate the number of homeowners who have opted for the average premium and finally dips to denote the number of homeowners who opt for policies with a high premium. The Average Premium of the tallahassee is mentioned at the top of the graph. Review: Excellent service! My microwave kept beeping and I thought i was going to have to buy another one! So I called ARW and they assured me they could help! It took them a day to get someone to my house and they replace the part for me! Now there’s no beeping! Review: This is one of the best things that I purchased for our home. Their services are friendly, they are knowledgeable and they are very responsive. If you\'re a home owner I definitely recommend it. It has saved me on many occasions where I needed something repaired but didn’t have all of the money, time or energy to put into it. Review: Worst service ever! I have trying to get a replacement washing machine since the end of August, its now the end of November. No one calls back when they say they will. Originally the purchasing department selected a washing machine for me, but the one they selected was on backorder. They asked me to pick a comparable machine and send them the model number, which I did. Then, without telling me that machine was also on backorder, they tell me I either need to wait until the end of December to get the washing machine, or I can take $800. The machine they were replacing my machine with retails for $1100+, that\'s because it is comparable to my broken washing machine, which was a front loader Bosch. However, they said they would only give me $800 because they can get an $1100+ washing machine for $800. Well of course they can as a corporation with a corporate account, but I cannot. So either I get an inferior washing machine to the one I was paying to have the warranty on, or I wait until the end of Dec because, for some strange reason, even though they selected the first washing machine from an online catalog they have a corporate logon to, they can\'t find a comparable machine to the first one they selected which is available now. Review: Unlike the ripoff home warranties that are a waste of money, this home warranty service is REAL and highly recommended. I was very happy with the promptness and quality of service. Just the peace of mind is worth the low monthly payment. The customer service is great when I asked questions about my ac warranty. In very short time I was contacted by a reliable and professional contractor. The contractor i met was highly qualified and wonderful. He stuck with the job and I was very satisfied. Review: Total Home Protection sent out an amazing contractor to fix the cause of a minor flood in my guest bathroom. Recently, I noticed that whenever I ran the sink in my guest bathroom, a pool of water would flood the bottom cabinet. I unknowingly forgot to warn my guests, and before I knew it, there was a mini flood on my bathroom floor. My guests were alarmed, and so was I. Total Home took the hassle out of a bad situation. The representative I spoke with was friendly and knowledgeable. She reminded me that the situation was bad, but it could’ve been much worse! If you’re considering purchasing Total Home’s warranty, you should. Unexpected repairs most consider when purchasing a new home, the focus is on memories to be made and nights in front of the TV, but you never know when mini disasters will strike. Really impressed by the unparalleled customer service and a quick response time of Total Home. Review: I would rate lower, but to rate requires at least one star. I payed AHS their premiums, but when my a/c died they declared it was preexisting condition. So, no resolution and I had to pay for repairs. I ended up replacing the unit. Don’t do it...stay away. Review: We just had a claim on a leaky toilet and it was picked up and handled immediately. Good timely repair service. I am very satisfied. Satisfied with Choice and with their service representatives. Review: I was without a refrigerator for a month. I called for the same repair 3 times. Tech came out and did the repair which last about 2 days. Instead of replacing the fridge, they offered me 180.00 to get my own repairman to fix the problem. I told them i needed a new fridge and they insist i wait until a 4th repair man can attempt repair. They already screwed me before by give me 200 for a new washer. Customer service was not honest. it was the supervisor who was not honest. I\'m done with Choice. Terrible customer service. They don\'t care if i have a fridge, they only care about sending out another tech. to waste my time and their money. Review: This is the worst company imaginable! I had my contract in place and premium paid in full then one of my AC units went out. A tech came out on 4/2/18 then nothing until I asked 2 weeks later. He said I needed a new blower motor. Then CHW assigned me to a new AC company. Today I was told that I was on my own because my problem was a "pre-existing condition"! I had another claim on 4/21/18 for my garage door going up and down on its own; I have yet to hear anything back on this issue. I\'m done with this company! I want my premium refunded immediately! Review: Second time in a week. Didn’t get repaired first time. Same issue again and this time parts will take over a week so if it gets fixed it will have been at least 3 weeks since we first called before our fridge is fixed. This is too long for a refrigerator. Review: My experiences with American Home Shield for several years have been superb. That is, AHS has been consistent in providing timely responses and excellent customer service whenever we required repairs of appliances and equipment. Further, AHS has some of the best contractors in Tallahassee and the contractors are technically proficient, have appropriate experience in their specialty, and demonstrate excellent customer service skills as well. Therefore, based on my experience and relationship with AHS, I highly recommend the company to all that need or would like to have a home warranty policy. It is as good a quality health care policy! Review: I am new with American Shield, as I use another warranty company for an out of state home. I expected the same service, since the service charge is double what I pay for the other home. I have had to call AHS 2 times. The first service call was for a heating/at unit. The service man was wonderful and knowledgeable, prompt. The second time was not so good - an oven was not working. The service call was delayed and when he did show he seemed to already know what was wrong. The part was ordered in November, and still no oven in February. I probably won\'t renew with this company. Review: I have filed several claims with AHS. All have been extremely easy and promptly handled. My latest claim was scheduled from 2-6, the technician didn’t arrive until almost 7. I was frustrated, but understood once I talked with him. He had a FULL day of repairs and we weren’t his last stop. He was extremely courteous and had our issue fixed within 30 minutes. We thanked him and gave him a snack for the road. Review: HORRIBLE customer service if you\'re actually lucky enough to get a hold of anyone. Waited for over 30 minutes for someone just to tell me my garage door isn\'t covered when it is stated in my paperwork that it is. I should have never switched to them! Review: I requested A/C service about two months ago. The tech that came was nice and seemed knowledgeable, but it took a few days to get it scheduled (and I have three kids, a wife who works from home, and it\'s hot). He said the system was too old to effectively cool the house and that he would request that AHS replace it. They didn\'t. 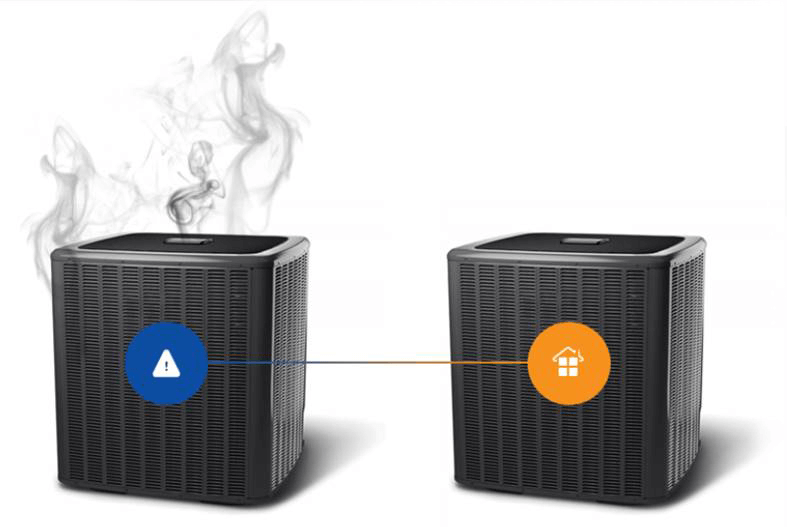 I had to request service again a month ago because it wasn\'t cooling at all, and the tech that time said that he got it to cool again (temporarily). It has since only worked intermittently. I tried to contact AHS to follow-up on the fact that it would not stay on and that the "repairs" are not fixing the issue. After waiting to talk to a customer service rep, one finally seemed to answer and then hung up on me. The system has completely stopped working again, and my baby and small children are HOT, and it is because they did not fix the problem the first time. Review: A utensil got stuck inside and the dishwasher went under breakdown. The problem happened in the evening and I had to lodge the claim online. We were amazed to see the technician with his toolkit at our gate the very next morning. This meant that Select is using an advanced online system which is well integrated and efficient. Review: The Technician was pleasant and easy to work with; he diagnosed the problem. unfortunately the appliance needs to be repaired again. I am hoping that this repair will be able to be fixed so that my tenants can be assured their refrigerator will keep their food cold, fresh and safe. Review: We have been very pleased with their service the last 2 years. This past Sunday we returned from a short trip to find our AC not working. We called and within an hour they gave us the name of the service group. We called and epected them on Monday. Within another hour they came and very professionaly efficiently and quicly had us up and running. Great customer service with CHOICE and great service by their technician.